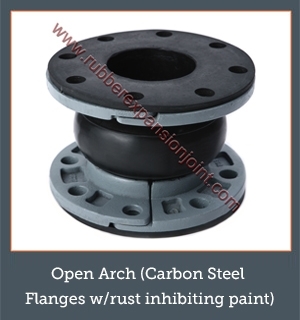 Rubberexpansionjoint.com WA style molded rubber expansion joints are designed with a molded integral flange and without a metal reinforcing collar molded into the necks of the body. Alternatively, the WA style uses a metal collar cast directly into the retaining ring. The WA style has a much larger arch than traditional spool type rubber expansion joints. This allows for greater movements and lower spring rates when compared to traditional spool type rubber joints. The WA style is also available in a filled arch design know as style WAF. 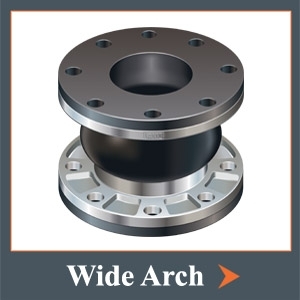 The WA and WAF are a great option for an economical wide arch rubber expansion joint. The WAF style or filled arch will reduce allowable movements by 50%. It will also increase spring rates by 4 times that of the WA style. The filled arch design is a great option to reduce turbulence and eliminates the ability of solids to settle and remain in the arch. The “filler” in the filled arch is made from a soft rubber material that is bonded to the ID of the traditional arch. The ID of the WAF has a one piece seamless inner tube eliminating the ability of the filler to come loose in service.